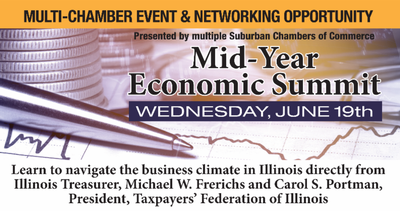 Learn to navigate the business climate in Illinois directly from Illinois Tresurer, Michael W. Frerichs and Carol S. Portman, President, Taxpayers' Federation of Illinois. With all the changes going down in Springfield and the upcoming elections this should be interesting. The Daily Herald will moderate the Q&A. Last year was great and we know it will be again! -What happened during the latest state legislative session and how will it affect your business? -What are the business trends in Illinois and how do they differ from our neighbors? -How is federal law affecting Illinois and what do businesses need to do? Registration-networking 7:30 am- 8:00 a.m.
Breakfast Buffet/Program begins at 8:00 and goes till 9:00 a.m.
Q& A 9:00 a.m. - 9:30 a.m.